As a parent and a teacher, Monique le Roux Forslund has first-hand experience of the effect food has on children. She has seen how sugar and other fast-acting carbohydrates can cause them to become over-active and struggle with concentration. 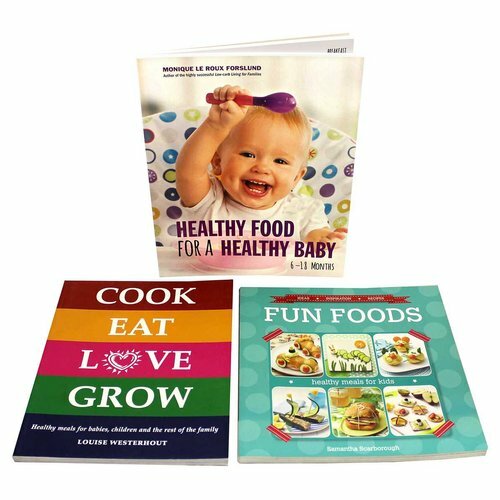 In Healthy Food For A Healthy Baby she shows you how to give your baby a healthy and nourishing start to life. In addition to the more than 100 easy recipes appropriate for babies aged six to 18 months, there are tips about natural good food to ensure that your child maintains all-round good health. Although this is not a ‘low carb high fat’ recipe book, the recipes do not include wheat fl our and sugar. In addition, there is information on encouraging your child to develop mealtime independence – aka baby-led weaning (BLW) – much sooner than you’d expect. Louise Westerhout delights in cooking for her son (as well as her family and friends) and seeing the results of good and wholesome food, as well as happy mealtimes. For her, cooking, eating and growing is an integral part of the fun of life. This philosophy is reflected in her ideas and recipes for meals for babies upwards of four months, as well as dishes suitable for the whole family. There is an emphasis on organic food and most of the 70-odd recipes are wheat- and sugar-free with many dairy-, egg- and gluten-free options as well. You will find new options and healthy combinations, using simple and inexpensive ingredients. The text encourages parents without being prescriptive, yet it is simple and practical to eliminate guesswork when it comes to feeding babies and children. Most mothers are familiar with the daily challenge of encouraging their children to eat healthy, sustaining meals that will fill them with vitality as well as nourishment. Fun Foods offers a treasure trove of ideas for how to create healthy meals for kids that are also inspiring and, well, fun! Covering salads, snacks, lunchboxes and sarmies, dinner, tea time, picnics, veggies and fruit, the chapters include many creative ideas for dishes that children can make for themselves, using their imagination. Throughout, the recipes have been styled to make everyday meals fun: think Funny Bunny Salad, Frittata Faces, Purple Pasta, Owl Rice Cakes and Sushi Sandwiches.